Green Lantern and mutants led the last round of reorder reports from Diamond Comic Distributors before the Black Friday weekend. Among comic books, Green Lantern #1 led retail reorders for the last week before Thanksgiving; Uncanny X-Men #1 (which had one less week on the shelves) second. 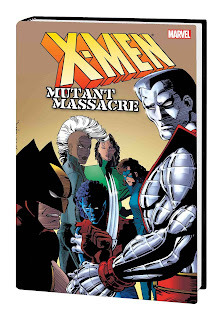 The X-Men Mutant Massacre Omnibus hardcover led the list in overall dollars. Click to see the charts for November 2018. Advance reorders found the Greg Capullo Batman Who Laughs #1 variant as the top-reordered December book, regular version second, an Infinity Wars #6 variant third. Click to see the charts for December 2018. Finally, we've established landing pages for all the months of 2019. We note when the calendar will favor or disfavor specific months, note some known comics and movie events, and mention year-to-year comparatives. See them starting (naturally!) with January; or go to our 2019 master page.